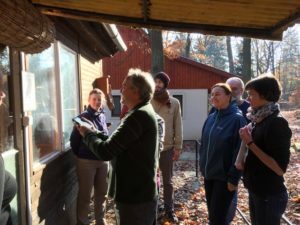 In the autumn of 2018 Bioregional Learning Centre was invited to be part of a consortium of partners developing Biomimicry materials for pupils aged 12 to 15. 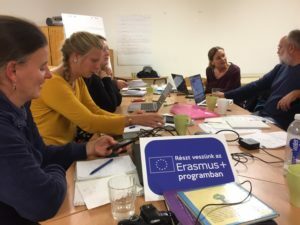 Learning from Nature is core to BLC’s approach to learning and so we are now a team member in the EU Erasmus Plus project called BioLearn. With 3.8 billion years of design expertise, Nature has a great deal to teach us about designing for a sustainable future. The first BioLearn meeting was in Hungary in November 2018. Together with partners from the USA, the Netherlands, Hungary, the Czech Republic and Slovakia we are adapting shared materials on designing from nature that will be suitable to use in our own countries. Here in South Devon we will work with three secondary schools and maybe one outdoor learning centre and angle the materials towards systems change for resilience in the bio-region. We want to make these materials relevant to place so that we can invite students to design and take part in projects that address real-world problem-solving on our doorstep. There are many ways to come at biomimicry, and explain what it is. You can find great explanations, resources and examples at Biomimicry 3.8, Janine Benyus’s consultancy. The idea that Biomimicry is a meme (like a highly adaptive gene that propagates and spreads through a population) comes from the ‘Biomimicry Resource Handbook’ by Dayna Baumeister. Here at BLC we are getting excited to see how the principles of design from nature map onto what we are doing in the Bioregion, and how. In Hungary our conversations surfaced ‘biomimicry is solution-oriented and an optimistic approach to technology: how could a mushroom teach us to make a car?’; ‘it is about waking up to the inspiration of the natural world and designing for the future as if nature matters’; ‘the key outcome of our project is young people with a transformed view of nature and a growing skillset to help them design a sustainable future’. BioLearn offers KS3 resources and hands-on support for teaching Biomimicry in South Devon. This is an EU Erasmus Plus project running from now til the summer of 2021. We are looking for four secondary schools to join us. ‘Bio’ means life (from bios in ancient Greek). Our project is about life and how Nature’s 3.8 billion years of ingenuity gives rise to more life. The materials we are developing are around themes like product design, circular economy and social innovation. They are hope-filled and inspiring, demonstrating how Nature teaches us to problem-solve, sustainably. BioLearn empowers pupils to design the future they want and offers learning that develops key competencies including critical thinking, working collaboratively, original research, and scientific enquiry. We are developing our learning resources to support STEM. For science teachers we offer learning aligned with working scientifically and addressing topics including climate change, biomimicry and local challenges. For Design & Technology we offer opportunities for pupils to solve real-world sustainability problems through applying nature-sourced design-thinking. If you join us, we will work directly with you to adapt BioLearn resources to meet your timetabling and needs. Secondly, we will invite you to a fully-funded 4-day Master Class in biomimicry delivered by BiomimicryNL in the Netherlands in early 2020. Thirdly, we will provide ongoing support during delivery and team teaching where appropriate. In return, we ask that you work with us to ensure BioLearn meets your pupil needs, assess the delivery of BioLearn during and after delivery, and provide feedback so we can improve BioLearn for both you and other schools. We are aware that your time is precious and will work with you to reduce barriers to implementation. BioLearn in the UK is delivered by Wild Awake and The Bioregional Learning Centre. Your local contact is Isabel Carlisle. Please contact us through this website or phone 01803 847976.